Is today's technology changing how we worship? YouVersion's Bible app. Photo by David Walter. With over 100 million downloads, YouVersion’s “Bible” app has nearly as many users as social media giants Facebook, Twitter, and Instagram. But it’s not just Christians who are incorporating smartphones and tablets in their spiritual life. From iQuran to iTorah, just about every world religion’s sacred texts can be found in the App Store. And let’s not forget Pope Francis’ Twitter account and its nearly 3 million followers. In his article “What Would Jesus Text? Smartphones Are Changing How We Worship,” Eric Larson explores this “digital shift” and the paradox of age-old practices and 21st century adaptations. "It's not uncommon to look out at the congregation and see everyone on their smartphones… We try to generate a lot of social media activity during worship." – Andy Wood, pastor at South Bay Church in Silicon Valley, CA (“What Would Jesus Text? 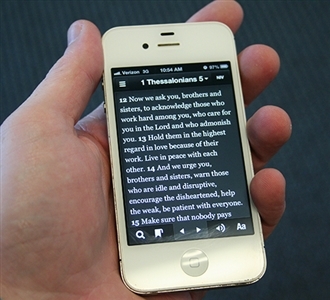 Smartphones Are Changing How We Worship” – Mashable). With many church-goers and even pastors using smartphones and tablets on Sunday mornings, it’s no surprise that both app developers and church staff are hoping to leverage this technology to engage church members.